Freezing is a simple, easy and convenient way to preserve vegetables. The process takes little time, but the cost of a freezer and the utility costs make it one of the more expensive ways to preserve food. The freezing process preserves nutrients and provides a fresher flavor than canning or drying foods. Freezing foods retards the growth of the microorganisms and slows down chemical changes that might cause food to spoil. While freezing slows down spoilage, when the food is thawed, the growth of bacteria, yeasts or mold will continue. Proper handling of vegetables is important before freezing. Choose young, tender vegetables to freeze. Overmature vegetables might be hard, tough or flavorless. To remove dirt, bacteria and pesticide residue, wash vegetables thoroughly in cold water. Drain and rinse several times. Lift vegetables from water to prevent redepositing of dirt and residues. Peel, trim and cut into pieces as directed for each vegetable in Table 1. Blanching vegetables to inactivate the enzymes that change the flavor, color and/or nutrients is important. Blanching helps destroy microorganisms on the surface of the vegetable. Blanching also makes vegetables such as broccoli or spinach more compact, this taking up less room in the freezer. The process of blanching takes place when a vegetable is exposed to boiling water or steam for a short time to retard enzyme growth. As soon as the blanching process is complete, the vegetables must be cooled rapidly in ice water. This stops the cooking from continuing. Change water frequently, or use cold running water or ice water. 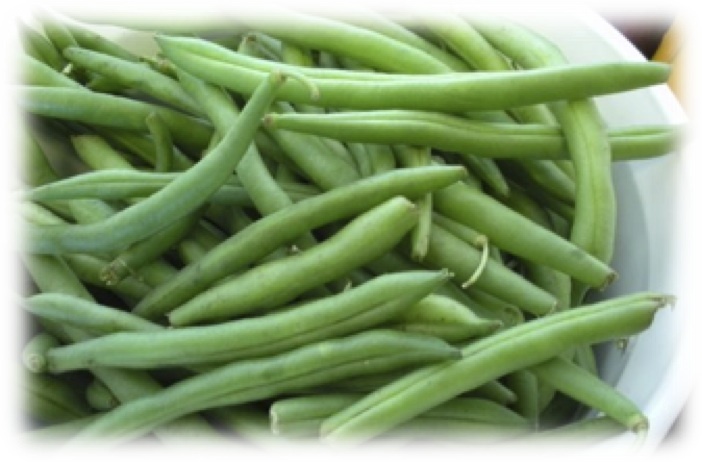 Blanching is important for top-quality frozen vegetables. Recommended guidelines for blanching times are used to ensure the vegetables are not overcooked and do not lose flavor, texture, color and nutrients. Under-blanching will cause enzymes to continue ripening the food. Use 1 gallon of water per 1 pound of vegetables (2 gallons for leafy greens). Place vegetables in wire basket or mesh bag; immerse in boiling water. Cover. If water does not return to boiling within 1 minute, you are using too many vegetables for the amount of boiling water. Start counting blanching time as soon as the water returns to a boil. Place one layer of vegetables in a wire basket. Suspend in steamer above several inches of rapidly boiling water and cover. Start counting steaming time as soon as the lid is on. Steam 1½ times longer than boiling water blanch time. Microwave blanching might not be effective, since research shows that some enzymes might not be inactivated. This could result in off-flavors and loss of texture and color. Those choosing to microwave blanch and risk low-quality vegetables should work with small quantities and follow directions given by the microwave manufacturer. This method will not save time or energy. 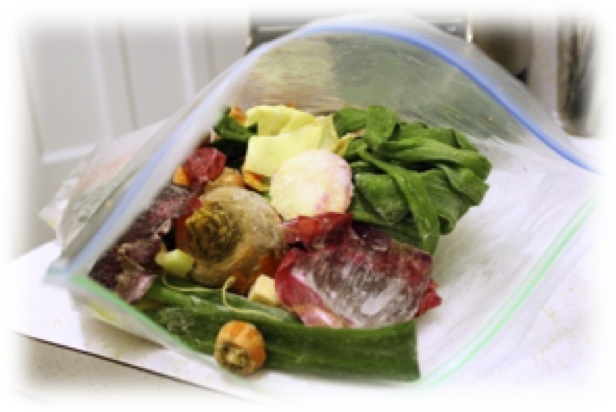 Pack vegetables tightly in freezer bags or rigid containers. Squeeze air from bags before sealing. Leave one-half to 1 inch of headspace for expansion in rigid containers. Excess air leads to flavor loss or off-flavors in frozen foods. If moisture evaporates, frozen food becomes dry, tough and might develop grayish spots called "freezer burn." To prevent air exposure and moisture loss, use only moisture-proof, vapor-proof packaging designed for freezing. Examples are "can or freeze" glass jars, plastic freezing containers, heavyweight aluminum foil, plastic-coated freezer paper and polyethylene wrap and bags. Only tape designated for freezing will adhere at freezing temperatures. Freezer bags can be placed in rigid containers for easy stacking. Do not use cardboard cartons; they are not sufficiently moisture-resistant and vapor-resistant for long-term frozen food storage. Also, do not reuse plastic containers from cottage cheese, ice cream, whipped topping, margarine, etc. These containers are not designed to protect foods in long-term freezer storage. For loose pack, freeze vegetable pieces in a single layer on a tray until frozen solid. Package at once. Label and date the product, and return it to the freezer immediately. Because water in vegetables expands during freezing and breaks cell walls, thawed vegetables might "leak" and have a soft texture. To retain quality, freeze vegetables quickly at the lowest possible freezer setting. Freeze only 2 to 3 pounds of food per cubic foot of available freezer storage space in 24 hours. Maintain freezer at 0°F or less to best protect the quality of foods, including vegetables. If power fails, keep freezer closed; food should stay frozen 24 to 48 hours. If available, protect food with 25 pounds of dry ice per 10 cubic feet of freezer space. Food can be safely refrozen if it still contains ice crystals. Some loss of quality and food value will occur. The more food put into a freezer in a year, the less the operating cost per pound. Keep an inventory and use the oldest foods first. Use frozen vegetables within one year. Most frozen vegetables can be cooked without thawing; corn on the cob should be partially thawed. Cook vegetables in ½ cup or less water per pint package to maintain nutrients. Drain and season as desired. Some vegetables do not make satisfactory products when frozen. These include green onions, lettuce and other salad greens, radishes, and tomatoes (except as juice or cooked). These vegetables can be stored for short periods in the refrigerator. Contact your local Ohio State University Extension office for information on proper storage. Information about growing various vegetables in Ohio can be found in OSU Extension's "Selecting, Storing, and Serving" fact sheet series at ohioline.osu.edu. 6 Wash thoroughly and sort by size. Leave whole or cut into 2-inch lengths. Blanch, cool promptly, drain, package and freeze. Beans: snap, green or wax 3 5 Snip tips and sort by size. Cut or break into suitable pieces. Small beans can be frozen whole. Blanch, cool promptly, drain, package and freeze. 6 Shell and sort according to size. Wash thoroughly. Blanch, cool promptly, drain, package and freeze. 45–50 Remove all but 2 inches of top. Wash thoroughly. Cook, chill and remove skins. Slice or dice if desired. Pack and freeze. Broccoli and cauliflower, 1½-inch florets 3 5 Trim. Separate into individual pieces. Cut broccoli stalk lengthwise. Soak ½ hour in salt brine (4 teaspoons of salt to 1 gallon cold water) to drive out small insects. Rinse and drain. Blanch, cool promptly, drain, package, leaving no headspace and freeze. 7 Trim, removing coarse outer leaves. Wash thoroughly. Blanch, cool promptly, drain, package and freeze. 5 Discard coarse outer leaves. Cut into wedges or shred coarsely. Blanch, cool promptly, drain, package and freeze. 8 Wash, scrape, trim and wash again. Dice or slice if desired. Blanch, cool promptly, drain, package and freeze. 16 Husk, remove silks and trim ends. Sort by size. Use large kettle for blanching. Chill in ice water for same time as blanching or corn might become mushy and develop cob flavor. Drain, package and freeze. Corn: sweet, cut 4 6 Husk, remove silk and trim ends. Blanch ears, then chill in ice water. Cut corn from cob, package and freeze. Eggplant 4 — Wash, peel and slice ⅓-inch thick. Include ½ cup lemon juice per 1 gallon water when blanching. Cool promptly, drain, pack, seal and freeze. For frying, pack freezer wrap between drained slices. — Cut off tops and roots. Wash and peel tough bark. Wash again and slice ¼-inch thick, dice into ½-inch cubes or leave whole. Blanch, cool promptly, drain, package and freeze. 3 Sort according to size. Wash thoroughly in cold water. Trim off ends of stems. Cut mushrooms larger than 1 inch across into slices or quarters. For better color: Mushrooms to be steam blanched should be dipped for 5 minutes in a solution of 1½ teaspoons citric acid per 1 pint water. Then steam, cool promptly, drain, package and freeze. To sauté: Heat small quantities of mushrooms in butter for 3 minutes. Cool, package and freeze. No blanching required. 8 Sort by size and wash. Cut off stems without opening seed cells. Blanch, cool promptly and drain. Leave whole or slice crosswise. Package and freeze. Onions 3–7 — Choose mature bulbs. Wash, as for eating. Blanch, cool promptly, drain, pack, seal and freeze. Frozen onions are suitable only for cooking. Freezing green onions is not recommended. Peas: green 1½–2½ 3–5 Harvest when pods are filled with young, tender peas that have not become starchy. Wash, shell and sort. Rinse peas again. Blanch, cool promptly, drain, package and freeze. Peas: field/blackeye 2 — Select pods when seeds are tender and well-filled. Wash pods. Shell and discard over-mature and immature seeds and those injured by insects. Wash shelled peas. Blanch, cool promptly, drain, package and freeze. 5 Wash thoroughly. Remove stems, blossom ends and any strings. Leave whole. Blanch, cool promptly, drain, package and freeze. Note: If the peas have started to develop or are already developed, shell and follow directions for green peas. 3 Wash, remove stem and seeds. Half, chop or cut into ½-inch strips or rings. May be frozen without blanching for use in uncooked foods; will have crisper texture. For use in cooking, blanch, cool promptly, drain, package and freeze. Peppers: hot — — Wash and stem peppers. Package, leaving no headspace. Seal and freeze. Caution: Wear food-handling gloves while handling hot peppers, or wash hands thoroughly with soap and water before touching face. Pimento — — Peel by roasting in oven at 400–450°F for 6–8 minutes or until skins can be rubbed off. Wash off charred skins, cut out stems, and remove seeds. Package and freeze. 8 Select smooth, new potatoes directly from the garden. Scrub, peel and wash again. Blanch, depending on size. Cool promptly, drain, package and freeze. Potatoes: sweet — — Choose potatoes that have been cured for at least one week. Sort to size and wash. Cook (in water, pressure cooker or oven) until almost tender. Cool at room temperature and peel. Then, either cut into halves or slices, or mash. To prevent darkening: Dip whole potatoes or slices in a solution of ½ cup lemon juice to 1 quart water for 5 seconds. To prevent mashed sweet potatoes from darkening: Mix 2 tablespoons orange juice or lemon juice with each quart of potatoes. 3 Select young, tender leaves. Wash thoroughly and cut off tough stems. Blanch, cool promptly, package and freeze. Squash: summer and zucchini 3 5 Choose young squash with tender skin. Wash and cut into ½-inch pieces. Blanch, cool promptly, package and freeze. For grated zucchini for baking: Steam blanch 1–2 minutes until translucent. Pack in measured amounts into containers and freeze. Squash: winter — — Select firm, mature squash with a hard rind. Wash, cut into cooking-size sections and remove seeds. Cook (in boiling water, steam, pressure cooker or oven) until soft. Remove pulp from rind and mash. Cool by placing pan of pulp in cold water and stirring occasionally. Package, leaving one-half inch of headspace. Seal and freeze. Tomatoes — — Select firm, ripe tomatoes with deep red color. Wash thoroughly; sort and trim. Raw: Wash and dip in boiling water for 30 seconds to loosen skins. Peel, freeze whole, or core and cut in pieces. Package and freeze for use for cooking or seasoning only. Juice: Cut into quarters or eighths. Simmer 5–10 minutes. Press through sieve. If desired, add 1 teaspoon salt per quart. Pour into containers, leaving one-half inch of headspace for pints or 1 inch for quarts. Freeze. Stewed: Prepare as instructed for juice. Cover and cook until tender, 10–20 minutes. Cool by placing pan of tomatoes in cold water. Pack into containers, leaving one-half inch of headspace for pints or 1 inch for quarts. Freeze. Kuhn, G. D., and A. V. A. Resurricion. How to Freeze Food the Right Way. Pennsylvania State University Cooperative Extension Service. Michigan State University Cooperative Extension Service. Preserving Food Safely. Version 3.0. Home Economics Library Program. National Center for Home Food Preservation. "How Do I? ... Freeze." nchfp.uga.edu/how/freeze.html.